This SpringLamp from TCP Lighting has 3-way technology that allows the bulb to consume 11, 15, or 27 watts of energy, emitting a different amount of light depending on the wattage. The bulb has a standard medium (E26) base and a long average life-time rating of 10,000 hours. 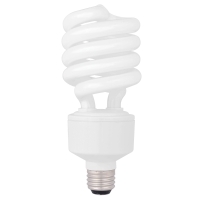 This CFL bulb is NOT permitted for use in completely enclosed fixtures and on circuits with timers, dimmers, or any other devices used to control lighting.